“We were always confident there would be growth in demand for electric vehicles. We’re seeing more acceptance,” Ford said. Ford will invest $900 million to boost its capacity to produce electric cars, creating 900 new jobs, the auto giant announced Wednesday. The vast majority of that investment will go to reconfigure an underused Southeast Michigan plant. The facility in the Detroit suburb of Flat Rock will become Ford’s second battery-electric vehicle, or BEV, factory. The latest move is part of an $11.1 billion investment Ford is making in electrification, echoing moves by key competitors such as General Motors, Nissan and Volkswagen. The new investment campaign also will see Ford open up a special center to produce its first fully autonomous vehicles. The automaker is holding back specific details but confirmed that facility will be located near its headquarters in the Detroit suburb of Dearborn. Separately, Ford announced it will be moving production of the next-generation Transit Connect commercial van from Europe to Mexico. Ford was one of the earliest to enter the electrified vehicle space, with a mix of hybrids, plug-ins and pure battery-electric vehicles, but sales have been modest, at best. That not only reflects the relatively slow growth of the battery-car market but the fact that the company’s all-electric models, such as the Ford Focus EV, have so far offered only limited range. With rival Tesla showing that the market is more interested in long-range offerings, such as the Model 3, Ford is racing to catch up. Last week, at the same time Tesla webcast the unveiling of its new Model Y sport-utility vehicle, Ford issued a tweet teasing the first of its own long-range models, something it has described as a “Mustang-inspired” SUV. “We haven’t given a timeline but it’s (set to go on sale) next year,” Hinrichs said. That long-range SUV will be produced at Ford’s Cuautitlan, Mexico, assembly plant, the first factory it is tooling up for all-electric vehicles. 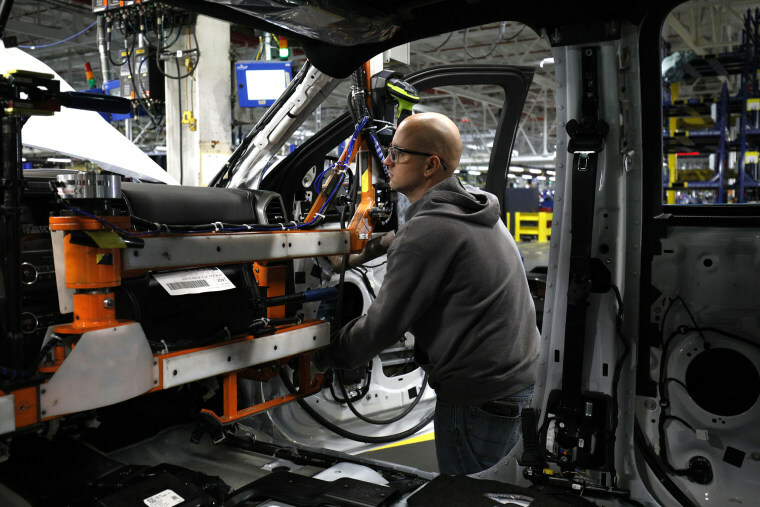 The Flat Rock, Michigan facility will go into operation by 2023 and will produce an even more advanced battery-car family, Ford said. Exactly how much of a market there will be for battery cars is uncertain and will almost certainly vary by market, according to research by such consulting firms as Navigant and Boston Consulting Group. China has now passed the U.S. in terms of plug-based models, including plug-in hybrids and all-electric vehicles. That has been driven by Beijing's New Generation Vehicle mandates. Europe is also seeing rapid sales growth that could expand exponentially if countries like Norway, Germany, France, and the U.K. follow through on proposed rules that would ban gas and diesel vehicles. The U.S. is also expected to see sharp growth, although that this could depend on President Donald Trump's ongoing review of proposed 2025 vehicle mileage standards. Virtually all of the major automakers are betting on big growth, with GM planning to have about 25 all-electric models in its worldwide fleet by 2025, and VW saying it will offer “50-plus” BEVs through its various brands. For his part, Hinrichs would only say Ford is working up “about 40 electrified vehicles globally,” but that includes 25 hybrids, as well as BEVs like the SUV it will introduce next year. Along with its push into electrified cars and trucks, Ford is also betting billions on autonomous vehicles, or AVs. A study released by Navigant Research this week listed its development program as one of the industry’s most advanced. It currently runs a major development center in Silicon Valley, but last year committed to setting up a combined electrification and AV development center in Detroit’s Corktown neighborhood. The next step is to set up an autonomous vehicle center where conventional vehicles will be modified to operate hands-free and even entirely without a driver. While the exact location of that facility isn’t being released, a statement from Ford said, “Production of Ford’s first autonomous vehicles will begin in 2021 for deployment in commercial services to move people and goods."